Butterflies are known for their grace and beauty. 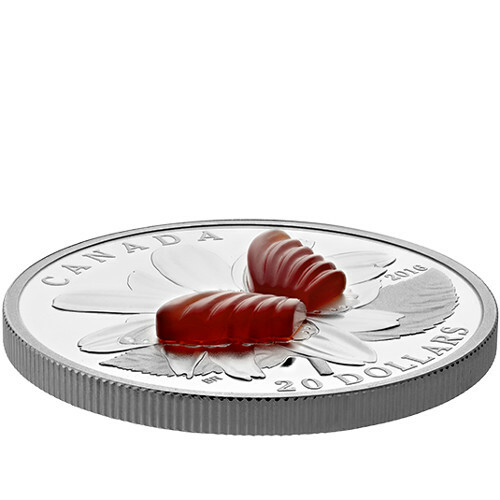 The Royal Canadian Mint captured the delicate grace of these amazing insects on a new coin. 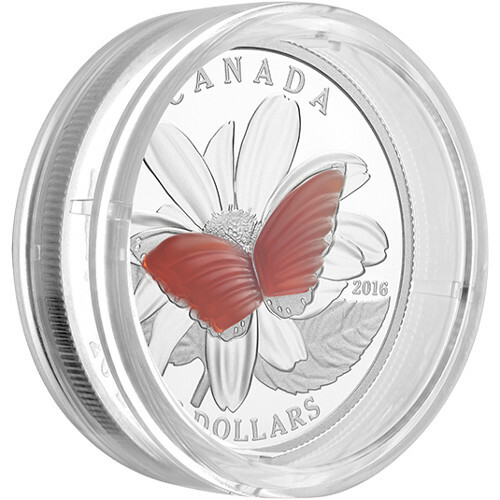 The 2016 1 oz Proof Silver Canadian Colorful Wings of a Butterfly Coin is now available at Silver.com. Ships in an RCM maroon clamshell. Total mintage limited to 6,000 coins! Face value of $20 (CAD) is fully backed by the government of Canada. Reverse features the image of a butterfly with agate-colorized wings. 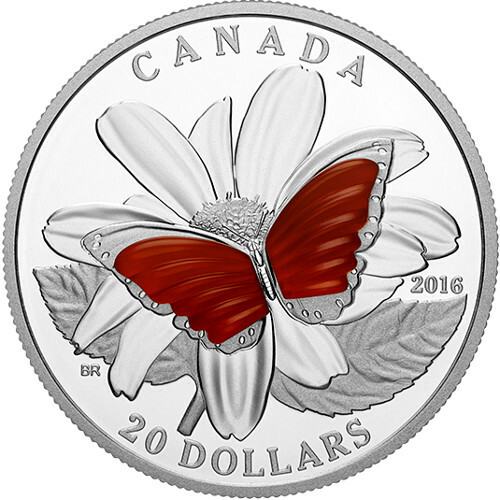 The obverse of each 2016 1 oz Proof Silver Canadian Colorful Wings of a Butterfly features Susanna Blunt’s depiction of Queen Elizabeth II. 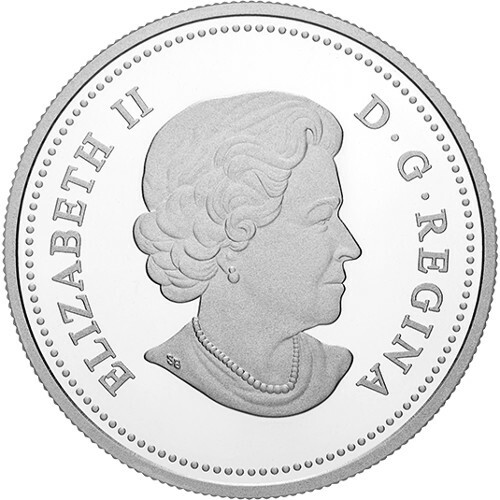 The image of the Queen can be found on the obverse of all Canadian coinage. This specific rendition of the Queen was created in 2003. The reverse of these silver coins features a brilliant butterfly design. This design uses translucent agate, a semi-precious gemstone, in a deep red color that perfectly captures the spirit of a butterfly’s wings. The agate is also textured, which really transforms the coin to make it look truly unique. This is the first time that the Royal Canadian Mint has ever used translucent agate as an embellishment on a coin. 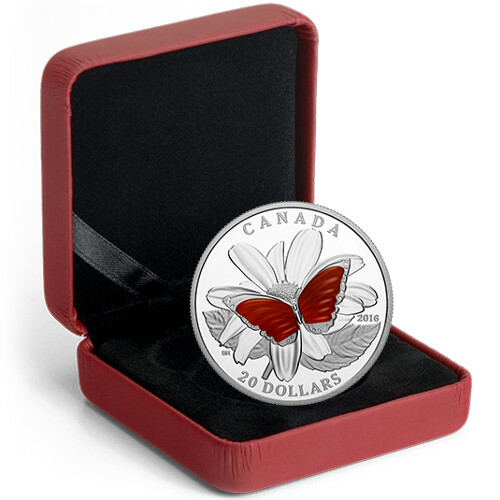 The 2016 1 oz Proof Silver Canadian Colorful Wings of a Butterfly Coins will ship out in the Royal Canadian Mint’s special maroon clamshell boxes that have a black velvet interior. Each coin will also come in a special capsule that is large enough to cover and protect not just the silver, but also the agate on the butterfly. The Royal Canadian Mint was founded in 1908 in Ottawa as a place for Canada to produce its own coinage. In the 1980s, a second facility opened in Winnipeg to help boost production capacity. As the official sovereign mint of the country, the RCM creates all the currency for Canada. Now, the Royal Canadian Mint produces some of the most sought-after coins in the world.